You know my temperature’s risin’, The juke box’s blowin’a fuse, My heart’s beat in’ rhythm, My soul keeps a sing in’ the blues— Roll over Beethoven, Tell Tchaikovsky the news. Don’t let the same dog bite you twice. It’s amazing how much you can learn if your intentions are truly earnest. Rock’s so good to me. Rock is my child and my grandfather. 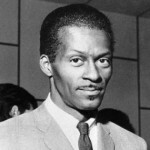 Charles Edward Anderson "Chuck" Berry was born in St. Louis, Missouri. He is an American guitarist, singer and songwriter and one of the pioneers of rock and roll music. After his release in 1963, Berry had more hits in the mid 60's, including "No Particular Place to Go," "You Never Can Tell," and "Nadine." By the mid-1970s, he was more in demand as a nostalgic live performer, playing his past hits with local backup bands of variable quality. Berry is included in several Rolling Stone "Greatest of All Time" lists, including being ranked fifth on their 2004 list of the 100 Greatest Artists of All Time.